Today, marathons are run in virtually every country in the world, all trying to attract your tourist dollar and entry fee. 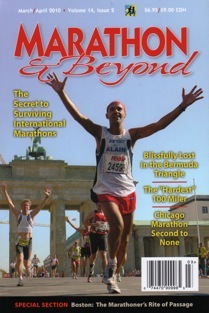 A glance through a three month stretch of the calendar put out by the Association of International Marathons (AIMS) reveals marathons in Thailand, Mexico, Ecuador, Finland, Brazil, Russia, Japan, Switzerland, India, Colombia, Panama, Germany, Poland, Great Britain, Estonia, Denmark, Italy, the Netherlands, Tunisia, Spain, Kenya, Ireland, Korea, Trinidad, and Greece, to name a few. Combining an international marathon with travel is a great way to visit other countries while enjoying your favorite pastime. However it doesn’t take much for things to go horribly wrong if you fail to plan ahead. Medical misadventure stories abound for tourists, businesspeople, and marathon runners while traveling overseas. Much of the problem lies in the fact that most of the more serious diseases that proliferate in underdeveloped or third world countries have been eradicated in the U.S.A. and we tend to expect this high health standard from the rest of the world. The reality is that health care around the world differs tremendously. Furthermore, it doesn’t take much for us to get sick even in westernized countries like in Western Europe or Australia and New Zealand. When we travel we may not pay as much attention to basic hygiene, or we may be fatigued from the travel and jet lag, which lower our resistance to whatever bug happens to be floating around at our destination. Travelers even complain of gastric upset from the clean water in westernized countries, as tap water has its own local microorganisms. When you toss a stressful, fatiguing endurance competition like the marathon into the mix of travel fatigue, jet lag, disorientation, change of diet, inexperienced travelers, alcohol, and third world countries, it’s amazing that more marathoners don’t get sick while traveling to overseas marathons. Planning your overseas trip around an international marathon requires preparation and foresight. These go a long way to helping you rectify medical problems as they occur. Here’s some advice from Dr. Mark Ochenrider, a primary care internal medicine physician who specializes in international travel medicine at Eastside Family Health Center in Kirkland, Washington, on what runners should consider when running in international marathons; “Become self-educated on the terrain, climate, and medical hazards well before traveling. For instance, in many countries it is not wise to swim in fresh water because of the risk of schistosomiasis and other diseases, but without research beforehand, you would not know this. Two websites that have excellent country-specific advice are cdc.gov/travel and travelmed.com. The UK also has a great website with similar info at http://www.fitfortravel.nhs.uk”. Dr. Ochenrider adds, “Food, water, and insects are the 3 main vehicles by which the vast majority of infectious disease enter the human body. Infectious diseases are usually just a terrible nuisance for the average traveler, but they can easily take runners out of the race. Think very carefully about caring for your health, self-educate, and get travel insurance and emergency contacts in case medical evacuation is needed”. First, let’s look at the more serious diseases that are prevalent around the world. Then we’ll move on to the seven medical problems you’re most likely to encounter when you run international marathons. I’ll finish up by listing the contents of the most comprehensive first aid travel kit you’ll ever see, so you can be ready for the most common glitches that could put you out of the race. We strongly recommend that you consult your doctor before traveling. They’ll look up your destination country on the Internet and tell you what booster vaccines, immunizations and inoculations you’ll need before traveling. Do this at least 6 weeks before you leave because some inoculations may require more than one injection in their treatment. The following diseases should be avoided like, well, the plague: Hepatitis A and B, Typhoid, Tetanus, Diphtheria, Japanese Encephalitis, Rabies, Meningitis, Yellow Fever, Malaria, Polio, Tuberculosis, Dengue Fever, Shigella, Elephantiasis, Smallpox, Pneumonia. Because of the life threatening nature of these diseases you should consult with your physician and research the Internet using the websites above. The individual causes and treatments of these diseases and the countries where they prevail are beyond the purview of this article, but you should be aware of the potential for them. If your doctor says you need immunizations for any of these diseases, take it seriously, get them done, and move on. Above all, if you are in a third world country and feel unusually ill, always consult a physician for diagnosis, advice and medication. Do not put this off, hoping your symptoms will resolve themselves. Most diseases are best treated with early diagnosis and medicine. Hotels often have a physician on call, or can contact one for you. Medical insurance is also indispensable if you are visiting a country where you could contract any of these diseases and it should include emergency evacuation coverage. Malaria is worthy of special mention. In malarial countries, the use of prophylactic medications is prudent. There are four main options (chloroquine, Malarone, mefloquine, and doxycycline) and choosing the right one depends on medication resistance patterns of the country you are visiting, as well as side effect profiles that make one or another more suitable for a given individual. Consult with your physician or a travel doctor to find the best anti-malarial medication for the country you are visiting. Malaria infects kills 1-2 million people each year, and is not to be taken likely. Being prepared for medical challenges is largely a matter of common sense. If you know what medical problems are most likely to occur, you can plan ahead for them by gathering the necessary supplies and information. Seven things top my “most likely” list of offenders: jet lag, blisters, dehydration, diarrhea, sprained ankles, head cold, and sunburn. All can ruin your final preparations for your marathon, or worse sideline you on race day, costing months of preparation. Fortunately, these are all easily preventable or treatable with judicious application of common sense. Here’s what to do if any of these arise. Jet lag is an insidious syndrome that can flatten you for your marathon race if you do not take certain precautions. And I’m still not convinced there are any really effective treatments for it. Caused by rapid transit across world time zones, jet lag disrupts our circadian rhythms (or body clock) that control our body temperature, heart rate, blood pressure, and other physiological patterns. It manifests itself as tiredness, lack of energy and motivation, dehydration, interrupted sleep, digestion problems, disrupted bowel activity, headaches, irritability, irrational anger, loss of concentration, lack of alertness, and disorientation—not what we want a few days before a marathon! Couple these side effects with over eating, excessive alcohol consumption, dry skin, nasal irritation, and fatigue from the air travel, and you’re a real mess. A major study by The Upjohn Company in cooperation with United Airlines and British Airways showed that 94% of long distance travelers suffer from the effects of jet lag, and 45% find their symptoms extremely bothersome. Strategies for coping with jet lag revolve around re-adapting your Circadian Rhythms to your new time zone by making arrangements to travel as comfortably as possible, manipulating your diet, readjusting your sleep schedule, getting sunlight exposure in your new destination, and exercising lightly your first few days. Scientists believe, to completely adjust to the new time zone, it takes one day for every time zone you have crossed, but this appears to vary widely. I report sadly, that not all symptoms of jet lag disappear at the same rate, and that these symptoms appear at different times of the day, in different people. The resynchronization of our cortisol levels and temperature take five to eight days, for example. We respond differently to jet lag according to our age, lifestyle and personal characteristics. Some people shrug it off while others suffer terribly by worrying about it. However, if you take the following steps, the worst of your jet lag symptoms should disappear within 3 days. Here are some ways to minimize its impact. We recommend that you try to pre adjust to your destination time zone by going to bed earlier or later before you leave. This means you get up and go to bed earlier several days prior to eastward trips (which are harder on the body than westward trips), and you get up and go to bed later for westward trips. You should also be well rested and minimally stressed before you leave. This means getting to the airport with plenty of time to spare. Set your watch to your destination time, and eat and sleep according to the local time at your destination, as soon as you can. If you travel when it would be night at your destination, spend as much time as possible asleep, and eat as little as possible. Some people take sleeping pills to help them sleep, although I’m not a fan because of possible side effects of these medications. Your physician will be able to offer better advice than I can on this controversial issue. If you fly during what would be daytime at your destination, stay awake. Get up and walk around the cabin and do stretching exercises in your seat. When possible, take an aisle seat. Drink plenty of water or fruit juice to prevent dehydration, which can worsen the effects of jet lag. Likewise, completely avoid alcohol and caffeinated drinks. Do not overeat while on the plane. Buy a set of Bose noise reduction headphones that fit over the ears to reduce your exposure to hour after hour of aircraft noise. These devices cut out almost all aircraft engine, vibration, and slipstream and turbulence noise. This constant, loud drone ranging from 60-88 decibels, takes its toll on your nervous system and I suspect is almost as fatiguing, at least in the short term, as jet lag. Take a walk outdoors in the sun (without sunglasses) to help you reset your biological clock more quickly. Early morning walks really help with this. Exercise lightly because it helps you keep awake during the day and sleep better at night. Do not overdo your running though, because you’ll be doing a marathon in a few days anyway, so you should be following a tapering program. Although easier said than done, avoid napping because it delays your body’s adjustment to the new time zone. If you must nap, limit it to one hour or less. Is the loss of sleep likely to affect your marathon performance adversely? Researchers of sleep deprivation have looked at its effects on VO2 max, treadmill running and walking to exhaustion, respiration levels, maximal heart rate and other parameters of endurance exercise. Generally the data shows that sleep loss ranging from 4-60 hours does not impair performance in short term, unskilled endurance activities like running, rowing and swimming. The adrenalin rush of competition (aka “arousal”) appears to override any negative physical consequences of sleep deprivation. Other sage advice on dealing with the effects of jet lag would include not driving a vehicle in your first 24 hours. Pay attention to what you eat, also. Eat high protein (meat, eggs, milk, fish, cheese, beans, etc) breakfasts and lunches, with higher carbohydrate evening meals. The logic here is that proteins help the body produce hormones needed for a full day, and carbohydrates help us sleep better at night. Does Taking Melatonin Minimize Jet Lag? The answer probably depends on whom you talk to. Some travelers (and doctors) swear by this serotonin hormone, while others feel it makes little or no difference. There is some evidence that it reduces the effects of jet lag. Melatonin, produced by the pineal gland in the evenings, helps us sleep better because it tells the body’s Circadian Rhythm that it’s time for bed. It resynchronizes and resets our sleeping pattern to the new time zone. Melatonin should only be taken in the evenings when you arrive at your new destination, about half an hour before bedtime. Avoid taking high carbohydrate food after taking it. Dosages range from 0.5 to 5 mg, with 3 mg being the standard adult dose. Melatonin can even be taken on the plane to help you sleep. Considering that it has no reported undesirable side effects, including residual grogginess, this is something you can experiment with on your next trip. However, it should be avoided if you are taking warfarin (coumadin) or any medicines used to treat a seizure disorder since it may theoretically interact with these medications. You know the drill with these nasties. Reduce the fluid from the blister with a sterile needle, wash the blistered area with warm, soapy water, and apply an antiseptic cream. Cover with blister tape or band-aids. If you have blisters before your marathon, apply Vaseline over the band-aid to reduce friction when you run. Dehydration is common in travelers, with walking around sightseeing, excessive heat, and an irregular drinking schedule. It’s particularly hard on marathon runners who should be taking it easy before the marathon, staying hydrated, and conserving their energy and glycogen stores. Dr. Ochenrider tells you how to stay hydrated: “Drink lots of fluids and make sure you can do so conveniently (e.g. camelback or other such device if needed), and be sure to drink fluids with electrolytes and natural sugars. This becomes all the more important if you become ill with traveler's diarrhea or any other illness that can dramatically increase your fluid needs”. The water in Western Europe is quite safe to drink, but you may find it has its own distinctive taste from the reservoir it is stored in. Belgium’s water, for example, comes from underground lime aquifers and has a strong calcium taste, rendering it almost unpalatable (although it is safe to drink). If you find the local ground water unpalatable, stick with bottled water. One town where I can guarantee you’ll enjoy the ground water is Rome. The water comes from ancient Roman aquifers below the city, and is the most delicious water you’ll ever taste. You can fill your water bottle from the cool, bubbling springs that empty into two thousand year old marble Roman troughs around the city. But, do not fill your water bottle from the many fountains in Rome (or anywhere else), where pigeons may have left their trademark calling card! Eastern European water is a different story. Tap water often contains giardia and other microorganisms that cause intestinal problems. Eastern European countries with reported water problems include former East Germany, Hungary, and Poland. Electric immersion coils, handy for boiling water for coffee or brushing teeth, can be found in travel stores. Montezuma’s revenge. Turista. The trots. The runs. Call it what you will, this ailment, arising from bacterial contamination of food or water, will make your life a nightmare for 3-5 days, until your meds kick in. It affects one third of the 20 million tourists who travel to developing countries each year. Precautions for preventing this debilitating sickness are simple. Says Dr. Ochenrider; “drink bottled water, eat at reputable establishments, and wash your hands or use an alcohol gel before each meal or beverage”. These precautions bear repeating. Do not drink tap water in third world or developing tropical countries. Consult your Guidebook or the Internet to see if the water is safe to drink at your destination. When in doubt, don’t drink it. As a general rule, first class hotels tend to have purified water and serve safe food. However many hotels in third world countries have their own filtration systems, but are not necessarily safe, so avoid drinking this water. If you are stuck somewhere where only tap water is available, it must be vigorously boiled for 5 minutes. Commercially processed water is generally safe to drink so stick to bottled water and other bottled drinks, canned fruit juices and carbonated soft drinks. It is safer to drink from the bottle or can, rather than a glass that may not have been washed properly. Clean off the outside of the can before drinking from it, or use a straw. And never drink water from a bottle that you have not opened yourself—the seal must be intact. Do not use ice in your drinks and brush your teeth with bottled water. Stay away from the salad bar because lettuce is difficult to disinfect. Ideally it should be soaked in Clorox and water for 30 minutes before serving, and no restaurant does this. Avoid raw fruits and vegetables unless they are peeled or cleaned—oranges and bananas are safest because they have a thick, intact skin. And stay away from buffets—you can get sick from these unprotected foodstuffs anywhere in the world, where they are exposed to germs and the heating is questionable. Eat off clean plates and use clean cutlery. Patronize busy restaurants with lots of people in them. Do not eat food from street vendor carts under any circumstances. Avoid unpasteurized dairy products like milk, soft cheese, yogurt, ice cream and cream sauces. Canned milk and powdered milk are safe to mix with clean water. Make sure all meat and seafood is well cooked (served steaming or piping hot)—never eat raw shellfish. Be particularly careful with seafood. If in doubt, do not eat it. Finally, just to be on the safe side, I’ve often had a slug of Pepto Bismol in the morning and evenings. What to do if you have the trots? Lotrimin, Imodium or Pepto Bismol work as a “stopper” for diarrhea. Standard doses are 4 mg of Imodium as a loading dose, followed by 2 mg after each loose bowel movement, not to exceed 16 mg daily. But you’ll eventually need antibiotics for self-treatment of moderate to severe diarrhea. Most travelers do not know that you can go to your physician before you travel and request antibiotics. Your doctor will give you a prescription on the spot, and you get it filled before you leave. It’s as easy as that. This is far wiser than waiting until you get the trots and having to look around for a pharmacy or doctor in a strange country wondering when your next episode will be and if there is a toilet nearby. Rehydrate using oral rehydration solution packets. One final warning: with prolonged or bloody diarrhea, seek medical attention immediately. It’s easy to turn your ankle while you’re tired and uncoordinated from jet lag and walking around. Walking on Europe’s cobblestone streets while gawking at towering cathedral spires is a bad combination for your ankles. Likewise with sidewalks that are torn up or have gaping holes in them, as are common in some Asian cities. If your ankle swells up immediately, apply ice ASAP and wrap it in an ace bandage to minimize further swelling. At night, rest your foot higher than your heart level on a pillow. Wrap the ankle in a neoprene ankle sleeve—readily available in drug stores in the U.S.A. These work very well to maintain compression on your ankle and provide support. I always pack one of these in my first aid kit. Ankle sprains respond well to anti-inflammatory meds that you should have packed in your first aid kit. Ibuprofen or Advil work well, or other non-steroidal anti-inflammatory drugs (NSAIDS) like Lodine, or Naproxen. Make sure you discuss with your physician what anti-inflammatory medication work best for you, before you leave. And beware: NSAIDS are hard on the gut, so should be taken in the prescribed dosage, with food. These can be picked up while your immune system is lowered from jet lag and fatigue. It’s the usual procedure for treating head colds. Drink plenty of fluids, gargle with warm salt water, or take throat lozenges for sore your throat. Saline spray can help ease nasal congestion and Tylenol will relieve any headache you may have. A pharmacist in your locale can recommend a cough suppressant or oral decongestant. Be warned about antihistamines: they can cause drowsiness that may almost incapacitate you. Vitamin C has modest scientific evidence suggesting that 250 to 500mg daily helps prevent head colds, and this was noted to be even more helpful for marathon runners and others engaging in high-intensity physical exercise. Clearly, avoiding sunburn should be your approach to this painful problem. Avoid running (and seek shade) between 10 a.m. and 4 p.m. when the sun's rays are strongest. When running on hot, sunny days, lightweight, light-colored clothing combined with plenty of sunscreen on both exposed and unexposed skin is the way to go. Tightly woven clothing is more effective at blocking UV rays than say, a white T-shirt, which allows UV rays to reach the skin. Typical cotton t-shirts only offers sun protection of about SPF 7 – less when it’s sweat-saturated. Choose t-shirts that you cannot see through when held up to a light. Add SunGuard (http://www.sunguardsunprotection.com) to your laundry – this colorless dye gives your clothes an SPF of 30 or more. If you’re going to spend the entire day outside get gear that offers built in UV protection. See the following sidebar listing of UV sun protective clothing brands. Numerous companies sell high sun protection clothing and hats including Sun Soul, Solar Bar, Columbia, Solar Tex, Solumbra, Solar Eclipse, Sun Clothing, Sun-Togs, Coolibar, Patagonia, and others. The Skin Cancer Foundation sells t-shirts that block 97 percent of the sun’s UV rays. Wear a wide-brimmed hat to shade your face, ears and neck while running. Tilly hats are my favorite. A hat with visor will not only shield your face, but will also keep your scalp safe from the sun. Lightweight baseball-style caps with mesh panels absorb sweat, keep you cool, and are more comfortable for running. But if you choose a baseball cap, remember to protect your ears and neck with sunscreen. Follow these practices to protect your skin even on cloudy or overcast days because UV rays travel through clouds. Wear sunglasses when training. There are some solid, sporty sunglasses available that block 90 to 100% of the sun’s UVA and UVB rays. Polarized sunglasses may be more expensive, but the reduction in glare is worth every cent of the extra cost. For runners, the higher the SPF (sun protection factor) in your sunscreen, the better. Don’t fiddle around with spfs of 30. Go for the full monty and use spf 80 or higher. This is because of the increased protection that higher SPF sunscreens provide, and also because most athletes don't use nearly enough to begin with. You should apply a full ounce (about a shot glass full) every couple of hours, and more if you’ve been sweating, which is what running is all about! You need a broad-spectrum sunscreen that blocks both ultraviolet A (UVA) and ultraviolet B (UVB). While UVA is up to 1,000 times more plentiful than UVB, UVB is about 1,000 times more potent than UVA in producing sunburn and redness. To find a sunscreen that protects against both UVs, look for Parsol 1789, also called avobenzone or oxybenzone, anthranilates, zinc oxide, or titanium dioxide on the ingredients list. The label will tell you if it blocks both types of UV rays. Standard procedures for treating sunburn include drinking water or sports drinks to replace lost body fluids. Taking Tylenol will reduce your headache, chills or fever. A cool bath will ease the damaged skin, and afterwards apply a light moisturizer. Stay out of the sun while your sunburn is healing, or cover it up. If you are taking antibiotics or anti-malarial drugs, consult a physician as to whether it will make you more susceptible to the sun’s rays. Take an American Red Cross First Aid course before you leave to brush up on emergency first aid procedures. If you feel unwell when you return (see symptoms in sidebar); or have been traveling for more than 3 months; or have been to rural areas, developing countries or a place with a recent epidemic of an infectious disease; or have been in contact with ill people; or have engaged in high risk activities such as visiting prostitutes or using shared needles, you should see your doctor immediately. Vomiting, diarrhea, fever, nausea, fatigue, poor appetite, yellowing eyes and skin, fits, shivering, dark urine, drowsiness, itching, coughing, spots on body, bleeding gums or blood in urine. Having traveled through 35 countries in the past 7 years, I always have the same debate with myself as to whether I should take a first aid kit or not. Common sense always prevails, and I pack it. Fortunately I’ve seldom had to use it, but for peace of mind I consider a first aid kit as essential as packing changes of clothing. This first aid kit list is comprehensive, and when everything is put together, can be quite bulky and weigh a pound or two. If you are traveling to another westernized country like Australia, New Zealand, England, or other Western European countries like France, Belgium, the Netherlands, Luxembourg, Germany, Monaco, etc, you might consider leaving the basic first aid contents like blister pads, gauze, disinfectant, band aids, lozenges, scissors, tweezers, tape, etc, at home, and buying them if the need arises in these countries. The above countries have well stocked pharmacies and knowledgeable staff. b) Alcohol hand gel (e.g. Purell) to effectively and quickly clean hands before any eating, drinking, food handling, etc. One other thing: If you bring personal prescription medications you’ll need to carry a list of the medications, their side effects, and interactions. This list should also have your doctor’s name and contact details, and who to contact in case of emergency. Pack your medications in your carry on bag. Last year, 30 million suitcases and bags were temporarily lost in transit worldwide, and 240,000 bags never reached their owners. You don’t want to be caught without your meds in an emergency medical situation. Antihistamine that you have used before. Over the counter antihistamines include chlopheniramine or Benadryl. Decongestant that you have used before for head cold or flu. Sunscreen. Use an spf of 80 or higher. In my opinion you need maximum protection when holidaying, especially in tropical countries. Oral rehydration solution packets. Ask your pharmacist for Oral Electrolytes Oral, Pedialyte, Exceed, or IAMAT Oral Rehydration Salts. These come in small packets or sachets with powder containing Sodium Chloride, Potassium Chloride, Citric Acid, Sodium Citrate, Dextrose Monohydrate. Although these come in liquid form, the constraints of packing liquid containers make the powder packets your best bet for travel. Anti blister tape. Band Aid makes an excellent oval shaped blister dressing called “Advance Healing Blister” that sticks well. Another good anti-blister pad by Johnson and Johnson is called UltraHeal Multi-Day Pads. Round foam pads. These foam rubber tubes fit around your toes and protect them from further blistering. The Traveller’s Healthbook, Editors Dr. Nick Beeching & Jonathan Lorie, WEXAS Publishers, London. Bugs, Bites ands Bowels: Travel Health. Dr. Jane Wilson-Howarth. Globe Pequot Press, London. Acknowledgements: the author wishes to thank Dr. Mark Ochenrider, primary care physician and international travel medicine specialist at Eastside Family Health Center, Kirkland, Washington, for his expert advice and assistance with this article. Disclaimer: The author and Dr. Ochenrider intend the information in this article to be a general guideline for the runner traveling overseas to do a marathon. This information is not intended to replace medical advice given by a physician. As we cannot anticipate any particular medical situation you may find yourself in, we cannot be responsible in any way for any and all direct or indirect applications or misapplications of the information offered here to any medical problems you might encounter. We strongly recommend you meet with your physician to discuss any and all medical problems you may encounter while traveling, before you leave the U.S.A. or your country of residence, and that you follow exactly your physician’s advice whether it agrees or conflicts with the information presented here. We cannot stress enough the importance of seeking medical advice for any and all medical situations you may find yourself in when the problems occur in foreign lands, no matter how trivial they may seem at the time. In other words, you’re on your own when you apply this information to any medical problems you encounter.